This delonghi coffee maker is big but good! A Delonghi coffee maker might not be as "advertised" as their more exposed espresso maker siblings. Take for example, ESAM 6600 that is under the delonghi espresso maker range, if you are into delonghi, you would have heard of it but not so for their coffee makers. 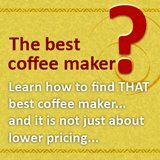 So, is a delonghi coffee maker good? 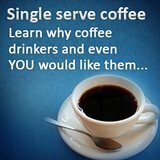 If you asked me how does it compares with Bunn coffee maker, my take is that while it is different, it more than serve its purpose! For this article, I would be using the de'longhi DCF212T frontal access 12 -cup coffee maker as a talking point. A first look at the coffee maker and you would noticed that it is too big, it would be taking up too much space on your counter top. While this is against conventional coffee maker design (all of them are trying to manufacture smaller coffee maker), this delonghi DCF212T has a frontal Access Feature, which means that there is no need to move the coffeemaker to fill it. And this is what I meant by different but more than serve its purpose. Of course, for those that have been reading my articles, you would know why I chose this coffee maker -it has a great "look and feel"! I do not deny this factor, this delonghi coffee maker looks very good with its black and and stainless steel finish, and I think that if a piece of equipment is going to be part of your house for a while, it is always good that it looks good. Of course, that is not all about this delonghi DCF212T. 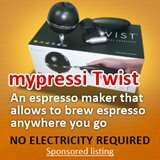 One thing to note about delonghi coffee maker and their espresso maker are their features, I find that delonghi usually come loaded with more features that brands like Mr Coffee or Bunn. This delonghi comes with the usual features of a 24 hour programmable digital timer and a 2 hour shut-off button. Two of their features which I think would add value to coffee drinkers are the aroma button and the pause and serve button. The aroma button works in such a way that it releases water in 30 seconds intervals to extract the best flavor and aroma from the coffee grounds. The water steeps the ground then 30 seconds later, another burst comes in to infuse the ground again. Pause and serve is similar to other coffee maker features that allows you to stop the brewing process and "steal" a cup before the brewing process completes, coffee drinkers really cannot wait! Delonghi espresso machine would be a name you come across if you have ever look for an espresso machine. It is affordable, reliable and has good customer service. Have You Heard Of Bar32 From DeLonghi? Delonghi bar32 is a popular espresso maker amongst all the delonghi coffee maker, the main value add is of course its ease of use. 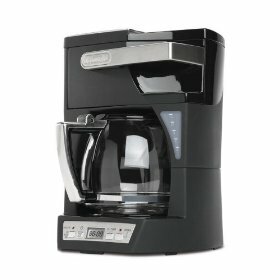 Why This 14 Cup Coffee Maker By DeLonghi Is Still Sellable? 14 cup coffee maker is a big brewer that many families might not want to invest in. So, why is this coffee maker by delonghi still so popular? Here we talk about 3 different delonghi coffee machines, while they all have different features and functions, they offered the same thing to a consumer -what is that? The Delonghi Espresso Maker That Does Not Look Delonghi! The Lattissima coffee maker delonghi markets for Nespresso is superb. In terms of cost, it is lower than most espresso maker, but it is better in terms of quality and operation. It does not matter if you do not know the differences between each of the delonghi cappuccino makers, knowing that there is a machine that is 50% cheaper, should sound interesting to you right? 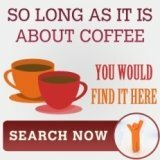 Have A Great Story About Delonghi Coffee Maker? Do you have a great story about Delonghi Coffee Maker? Share it! Time to upgrade to delonghi coffee maker?